UCLA undergraduates are “Engaging Los Angeles” through the Center for Community Learning, performing meaningful work in the diverse communities of Los Angeles through academic programs ranging from one quarter to two years. As students learn alongside our region’s inspirational leaders, they build skills in critical thinking and gain experience working in teams to address some of the most pressing challenges of the 21st century–from hunger and homelessness to educational equity or environmental justice. Click on the map below to explore how UCLA undergraduates are engaging Los Angeles through one of the Center for Community Learning’s signature programs: service learning courses. This map documents the range of our work collaborating with community partners across seven impact areas: Arts & Culture, Education, Environment, Food Justice, Government, Health & Wellness, and Human Services. 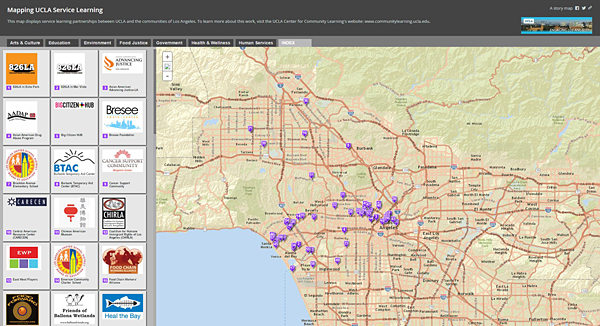 This interactive “storymap” was developed by Center Associate Director Elizabeth Goodhue in collaboration with the UCLA Center for Digital Humanities . If you are a faculty member or graduate student interested in developing a community-engaged course, visit the Course Development page of our website or contact Associate Director for Engaged Teaching Dr. Elizabeth Goodhue .